Roughly 100 species of snakes inhabit Paraguay, a nation in central South America. All of the snake species in Paraguay fall into one of several taxonomic families. While many of these snakes are harmless to humans, some are highly venomous or otherwise dangerous. Of all the snake species in Paraguay, the majority of them -- 68 -- belong to family Dipsadidae. These small snakes have grooved fangs at the rear of their mouths, which they use to inject their venom. Their venom is weak enough that they're generally not thought of as threats to humans. Members of this family in Paraguay include the Paraguayan blackhead (Apostolepis ambiniger) and the Patagonian racer (Philodryas patagoniensis). Members of family Elapidae are generally highly venomous; their bites can be deadly to humans. This family includes cobras, sea snakes and coral snakes. Seven species of this family inhabit Paraguay, all of them coral snakes, including the southern coral snake (Micrurus frontalis), the painted coral snake (M. corallinus) and the Argentine coral snake (M. pyrrhocryptus). Family Viperidae includes vipers, pit vipers and rattlesnakes. They have a sophisticated venom delivery system with hollow, hinged fangs that directly inject venom into their prey. Some vipers can spit venom. Seven members of this family live in Paraguay, including the painted lancehead (Bothropoides diporus), the Mato Grosso lancehead (B. mattogrossensis) and the tropical rattlesnake (Crotalus durissus). Roughly 70 percent of all species of snakes in the world belong to family Colubridae, although just 10 species of this family are found in Paraguay. It's a diverse family, with few features that apply to all members. Colubridae in Paraguay include the parrot snake (Leptophis ahaetulla), the two-keeled sipo snake (Chironius bicarinatus) and the tiger rat snake (Spilotes pullatus). Family Boidae are a nonvenomous group, which encompasses snakes such as boas, pythons and anacondas. They're fairly primitive and some species even have vestigial remnants of find legs. There are five species in Paraguay that belong to this family. 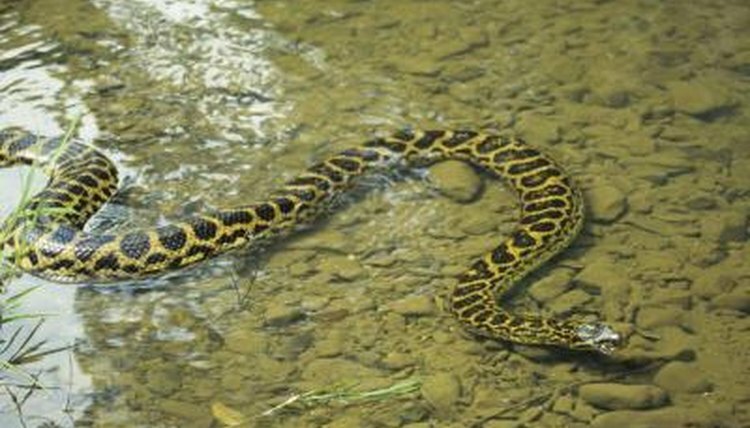 These include the yellow anaconda (Eunectes notaeus) and the eastern rainbow boa (Epicrates crassus). Six members of the infraorder Scolecophidia exist in Paraguay, belonging to three different families. Two belong to the family Anomalepidae, known as slender blind snakes: the dark blind snake (Liotyphlops beui) and Ternetz's blind snake (L. ternetzii). Three, known as threadsnakes, belong to the family Leptotyphlopidae: the Tucuman threadsnake (Epictia albipuncta), the pantanal threadsnake (E. munoai) and the beaked threadsnake (Rena unguirostris). One final species belongs to family Typhlopidae: Brongersma's blind snake (Typhlops brongersmanius).